The classic teachings of T’ai Chi Ch’uan tell us that if there is a problem with our form, look to the legs. As a Yang Style Instructor for the past 33 years, I can readily agree. Most people in the West do not have the varied possible usefulness of their feet and legs because of wearing shoes, sitting on chairs, driving cars, and playing sports emphasizing upper body strength. The practice of Tai Chi can help students re-establish their connection to the earth and more fully integrate the feet and legs into the body as a whole. Tai Chi players learn that the earth is the source of Yin energy that enters through the “Bubbling Well” point on the bottom of the feet. We use the interaction of the feet and Earth to generate the power used to move the body, and we use the earth to ground the energy directed at us from an opponent. Tai Chi is becoming increasingly recognized in the West for it’s ability to aid the infirm and elderly gain balance and stability because of Tai Chi’s demand of conscious feet and leg work. I have had Instructors in their 70’s,80’s, and even 90’s who can still move with grace and beauty, and they continue to inspire much younger students to keep up with their practice. In this article, I will discuss the intricate and interesting actions of the foot and leg work in Yang Style Tai Chi, as it manifests in stances, stepping, kicking, blocking, sweeping, and trapping. Each instructor has learned from those who have gone before. I learned from Choy Kam-man who learned from his father, who learned from Yang Chen-fu, who learned from his father, and on and on. Each hopefully took in this accumulated knowledge, studied and practiced, and after mastering this information, refined or changed it to suit his or her own personality and body. That is why we have so many different forms and ideas about what is correct. I am writing about what I know works for me. Even though you may have learned something different, I hope this discussion opens your mind to other possibilities, or at least stimulates you to look more closely at what you are doing and why. So let us explore together this controversial and sometimes overlooked aspect of Tai Chi training. This stance is used only twice in the Yang Long Form. First at the beginning when it sets the tone and mood for all that is to follow, and at the end when this stance allows us to completely relax and experience the inner work we have done. The Tai Chi classics teach us to be single weighted, weight mostly on one foot or the other, yet in the Horse Stance we are double weighted. Most practitioners use Horse Stance when they rise up in Cross Hands and when doing Wave Hands Like Clouds. I don’t, based on my desire not to be double weighted. When I rise up in Cross Hands, I keep more weight on one foot or the other to make for quick movements into Carry Tiger to Mountain. In Clouds Hands, the weight is constantly being shifted from one foot to the other and shouldn’t be double weighted at any time. The Horse Stance is the most meditative and balanced, allowing firm relaxation. In taking this stance, we set about to achieve the Wu Chi state. Wu Chi, in this context means the body is able to achieve complete active relaxation with no undue stress. The feet are placed solidly on the floor, shoulder width, with toes facing forward and parallel to each other. The three physical points ( triangle of balance) of the feet – the base of the big toe, the base of the little toe, the heel, – as well as the outside arch, are all in contact with the floor. We visualize the Yung Chuan (Bubbling Well) point on the bottom of the foot, just below the ball in the center of the foot. This point is important for our interaction with the Yin Chi of the earth, so we open it with our intention (Yi). It is through this point that we sink our root into the ground. Each body part is then placed squarely on the one below it, like building blocks, with all joints open and not locked. Locked joints restrict movement, response time, and Chi flow. The joints are filled with fluid to allow compression and movement, so keep this in mind in order to keep from getting stiff. Visualize the joints pumped up (peng energy) like balloons. The top of the head has the feeling of being lifted or hung from above. This is achieved by pressing down into the feet with our Intention. Imagine carrying a jug of water on the top of the head. In order not to spill any, we must remain upright ,balanced, connected, and relaxed. At the same time, the breath is directed into the Dantien which is our physical and energetic center. It is of utmost importance to realize that all parts of the body connect to this center. Therefore when we move, step, kick, etc., we do not visualize these actions coming just from the hip joint. Remember, all movement originates from the Dantien. This stance starts with the body standing upright and then the weight sinks downward until the knees just cover the toes. The Bow Stance is the basic Yang energy stance. It gets its name from the stance an archer takes to shoot an arrow. 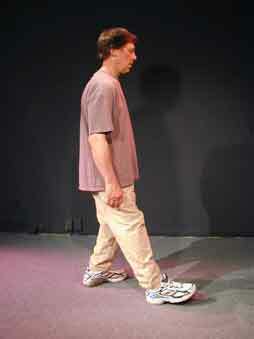 The feet are shoulder width with one foot placed in front of the other. The rear foot is turned out approximately 45 degrees to the direction the front foot is headed. This is the most natural relationship, with other angles used for special applications and stretching. Both feet are flat on the ground. The spine is erect. The weight is on the forward foot. This stance is generally used to deliver energy ( push, press, punch) and is especially important in stopping forward momentum (grounding energy into the front foot when being pulled, or when our partner moves out of the way of our push). This stance allows opponent’s incoming energy to be easily grounded into the rear foot. The main disadvantage is that the forward leg, being weighted and closest to opponent, can not move out of the way quickly and is vulnerable to kicks and sweeps. 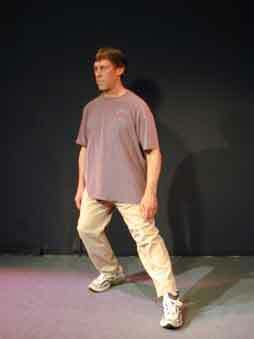 The sit stance is used to draw opponent out of his center while remaining centered ourselves on the back foot. Examples include Roll Back and the first part of most movements. Kicking is rather slow and limited in this position as the forward foot still has energy and root in it to make moving back into Bow Stance quick and easy. Note: Bow and Sit stance are used together, and use the same base, which follows the Tai Chi rule that if we want to push, first we must pull, etc. The two legs work in perfect harmony, like a two person saw. One leg pushes and the other gives a bit of resistance by pushing back. These are used together to set up a reaction in the opponent so we can borrow his energy. There is much discussion about how much weight is placed on the feet when using these stances. It is my experience that it varies greatly depending on many circumstances, the most common ratio being 60/40 or 70/30. Being overly concerned about the exact proportion can create tension. Sit Stance with turning. This is used whenever we retreat and turn the body. It is our essential neutralizing movement. What is important to note is that the torso never turns further than the nose pointing to the knee. Notice in the pictures that the knee covers the toe and points in the direction of the toe. The nose points in the same direction. 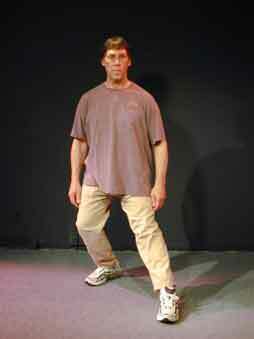 This is the most common martial art stance. The weight is on the rear foot with the front toe just touching the ground. The heel should be lifted only an inch or so. It is an error to have the heel too far off the ground as it brings tension to the calf. The leg is relaxed with the knee bent to allow reflex quick response. 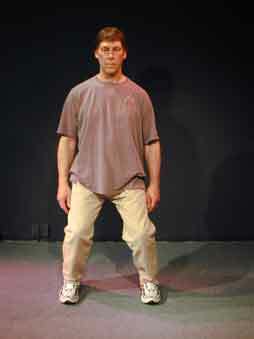 This stance is used in transition between movements, between parts of movements, or at the end of a movement to indicate the ability to kick or block with the foot or knee. A good example is Stork Spreads It’s Wings. This stance is similar to the toe stance only with this stance the heel is just touching the ground in front of the body, with the leg fully extended but not locked. The toe is lifted an inch or so off the ground. Any more than this can cause tension in the front of the shin. 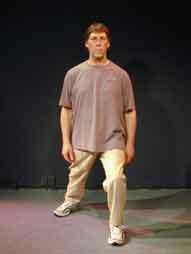 This stance is used quite frequently and is actually a foot kick or stomp. The opponent is drawn into our strength and then attacked with hands and feet. Examples include Play the Fiddle, Raise Hands, and Fist Under Elbow. We are always stepping in relation to an opponent, so the exact relationship between width and length varies with the application. If the opponent is close, the stance will be shorter and narrower to make quick movement possible. If we are throwing the opponent over the leg, we need a longer and wider stance in order to get the leg behind him. Straight punches, like Step Up, Parry and Punch, can use a long and narrow stance, while twisting punches, like Hit a Tiger, need a shorter and wider base. Stepping back is determined by how far the opponent is stepping in, but generally the Retreat Step is longer and narrower,since twisting is not much of a consideration. As the stance gets longer, the width narrows and the rear foot turns out to a greater degree. Fixed step push hands can use a long and wide stance for stability in all directions, while moving push hands uses a shorter and narrower foot relationship for quick changes of position. 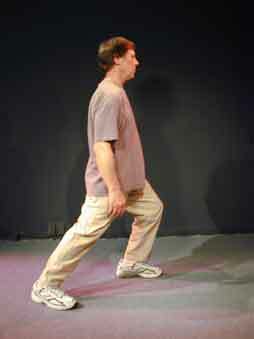 In Tai Chi stepping,one steps as far as possible without breaking the rear foot root. Shorter lengths mean faster movement, while longer lengths allow greater use of power. Shorter lengths are easier for beginners, while longer lengths are a good training tool to develop strength. Longer lengths along with narrower widths are used for straight forward movements like Fan Through the Back, while shorter lengths and wider widths are used for turning and twisting movements like Turn and Chop Opponent with Fist. The general rule is that the knee just covers the toe in all stances. A deeper stance where the knee extends out past the toe will put too much of a strain on the knee itself, while having the knee in a more upright position (not covering the toe) will not allow as much exercise or develop as much compressive power. It is extremely important to always have the knee move in the direction that the toe is headed. The most common Tai Chi injuries are caused by not following this rule. 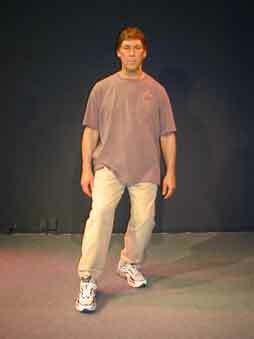 Tai Chi stepping is different than normal walking. 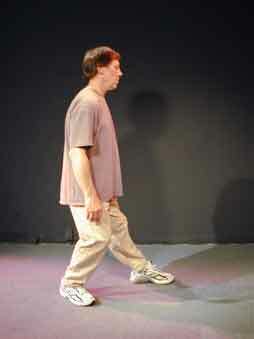 In normal walking, most people let their upper body more or less fall forward and their legs move ahead to catch the body from falling over. 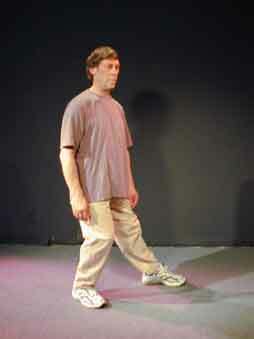 The walker is almost always out of balance with the upper body leaning forward and the legs trying to catch up. In Tai Chi we can never afford to be out of balance, so we step differently. We always keep a root on one foot and step while maintaining that root, and then only move forward when we have established a new root with the forward foot. If I want to step forward with the right foot, for instance, I must first shift my weight to the left foot establishing a solid root, then step forward with my right foot as far as I can without moving any weight off my left foot root. Only when I have placed my right heel on the ground and rooted it, can I then shift my weight on to the foot. One of the most common errors in Tai Chi practice is to break the root of the weighted foot before the root is established with the stepping foot. This means that, for a brief moment, there is no root and the body is vulnerable to being pushed off balance. It also usually means that we have stepped too far to be able to withdraw the forward leg without moving the whole body slightly backwards to compensate. To test this, take a long step, as far as possible. Shift forward, then shift back on to the rear foot and try to lift the forward leg off the ground without moving your body at all. If it can’t be done it means we are vulnerable to foot sweeps and kicks. Stepping is a key ingredient in Tai Chi practice and application. When Tai Chi was used primarily as a self defence system, quick steps and appropriate movement was essential. Now there is more emphasis on slow, relaxed, balanced movements for health. Not only that, but our primary partner exercise, Push Hands,generally uses fixed step, so stepping has lost most of its significance. It is still very important to understand why we are stepping the way we do in each movement if we want to master the art. Let’s look at some more basic points before we look at the specific types of stepping. The philosophy of Tai Chi does not allow unprovoked attacks on an opponent. We only act when threatened, and then we want to do the most with the least amount of effort. We want to borrow our opponent’s energy and return it to him at the appropriate moment. We step only because we have to. The reason we move in Tai Chi is to gain a better strategic position.The best place to be in relation to our opponent is behind him. Next best would be on his weak side, and least desirable but most probable, would be to stand in front of him. When stepping we attempt to step as far to the rear or side of our opponent as possible. Other reasons for stepping include: setting up attacks, changing distance for kicking or striking, moving out of the way either backwards or to the side, blocking attacks, and drawing the opponent out of his center. We need to be able to move in any direction quickly and easily. Also as a general rule I would say that if we can’t kick from a stance or while stepping, there is something wrong with what we are doing. We should be able to kick at any time. So let’s look at the types of stepping we use in Tai Chi. This step is used throughout the form whenever we want to step one foot forward and then move the body weight onto it. A good example is from Stork Spreads Its Wings to Left Brush Knee. We are going from an Empty Step into a new position without changing the rear foot position. There are many considerations in making this Simple Step in the Tai Chi form. In this movement application, I assume my opponent is in front of me and is attacking me with his right hand. I first neutralize the attack to the right side by turning my torso slightly to the right and at the same time, bring up my left hand to join, stick, and lead his energy to the right, closing him up. At the same time, I borrow and store his energy into my right Kua ( the area around the hip which includes the inquinal ligaments, psoas muscle, and upper thigh). It is this area that transfers the energy from the legs into the waist area where it is redirected. I then step with my left foot and place it next to his leading foot. When placing my foot, I do not move my body off its right foot root. Only when I establish a root with the left foot am I ready to move my body onto it and release my stored energy into my opponent. The energy for the release comes from the stored energy and is intensified by the use of my torso in a twisting like fashion. It is important to realize that energy is gathered and released in two major ways in Tai Chi – compression and torque. Compression (gathering of energy) happens when two surfaces are brought closer together. The energy is released when the compressive force is no longer there. A good example is a spring, or in Tai Chi, the movement Push. Torque (gathering) happens when two surfaces are twisted in opposite directions or one surface is stable and the other is twisted. When the twisting force is no longer there, the release happens as the object turns back into its original shape. In Tai Chi, the feet are stable, the waist is turned, and when the force is no longer being applied (neutralized), the body wants to twist back into its straight and natural position. Therefore it is important when stepping ahead to keep the slight twist in the waist, and not release and turn until the weight starts to move onto the left foot. I often see practitioners turn and gather, step and turn back releasing the torque, then shift the weight forward. I think this is an error and wastes some of the stored energy. To summarize the Simple Step going from Stork to Brush Knee. First turn the waist to the right until the nose points to the right knee. Next step forward the left foot as far as possible without moving the body and place it forward and slightly to the left. The nose still points to the right knee. Finally, as the weight shifts onto the left foot, the waist turns until the nose points to the left knee and the left knee just covers the toe. Twist and gather energy, step, release the twist as the weight moves forward, and let the energy go. This process is the same no matter if we are turning completely around (e.g. Fair Lady Works at Shuttles) or a half circle (e.g. Single Whip ) or a quarter turn (from Repulse Monkey to Slanting Flying). It is always the same. Gather,step, release by turning the waist and moving at the same time. There are very few times when we gather energy moving straight back and then release it moving straight forward. Push is one of those exceptions. In this step, the weight is taken off the forward foot by moving the body back to the the rear foot, then the front toe is turned out by pivoting on the heel, the weight is then shifted back on to the forward foot, the rear leg takes the step forward, and finally the weight is shifted to the now different forward foot. This sounds like a strange way to go about stepping forward to most beginners, yet it is probably the most common of the forward stepping styles in most people’s forms. It is good for exercise, easy on the knee, relaxing, and has some martial value in the area of neutralizing before stepping. This step has a Yin quality to it. 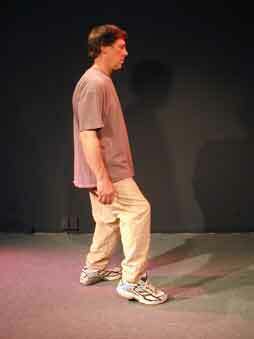 This type of forward step requires a firm root and good connection from hip to foot. Instead of shifting the weight back before turning out the forward foot as in the previous example, the weight is left on the forward foot and the toe is turned out using the torso, which releases the rear foot for its step forward. Most beginners find this step more difficult then the unweighted forward step as the strong connection between the foot, knee, Kua ( groin area) and hip necessary to do this step correctly may not yet be established. It is very important in this, and all steps, to make sure that the leg turning is integrated with Dantien. The main fault I see with this step is turning out the front toe and leg without having the center initiate the movement. Note: There is much controversy about which of these two forward stepping techniques is correct. It is my experience that both are valuable and correct so I practice and teach both. The student starts out learning the unweighted step in the first section of the long form, and after gaining strength and connection, learns the weighted foot step in the second and third sections. 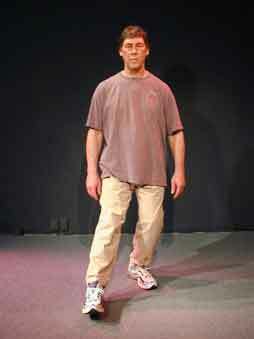 In this step, the rear foot is brought up, usually next to the forward foot, then the forward foot steps ahead. With this step, which foot is forward does not change, as it does with the weighted and unweighted steps. If the right foot was forward, it will still be forward at the end of the step. The Step Up is very good for moving in to push, especially if you have your strong side already forward. The Step Up is usually done in a straight forward motion and is not good for making turns. It is a very natural way to move in and set up applications. Watch most fighting styles, like boxing, and notice the fighters will usually keep one side forward, facing the opponent, the whole time and when he wants to attack, he will spring forward and then bring up the rear foot. Play the Fiddle is an example. This step is not used often in the Long Form. It is used more frequently in the Yang Style Applications or Partner Form. (5) Replace Step ( Advantage – natural and easy. Good for neutralizations and foot kicking while stepping). 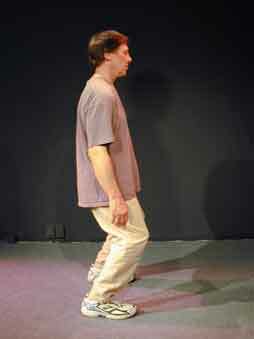 This forward stepping technique is used sparingly in the Long Form, and frequently in the Application Two Person Form. I understand that some practitioners do their Tai Chi forms with out using this step. I personally find this way of repositioning the body to be the most natural, quick, and easy. A good example being Step Up, Deflect Downward, Parry, and Punch. In this step, the weight shifts from the front foot to the rear foot, the forward foot is then lifted and replaced at a different angle, the weight then shifts onto the forward foot, and finally the rear foot is replaced into a different position. It is quite similar to the Unweighted Foot Step, the only difference being that in the Replace Step, the forward foot is lifted off the ground and then replaced at a different angle , while in the Unweighted Step, the front foot is kept rooted through the heel while being turned out. In Replace Step, kicking with the forward foot before or as we are stepping forward is a strong option. It also can be used in a hopping like fashion for a speedy change of which side of the body faces the opponent. In Yang Style Side Stepping, we generally keep the two feet shoulder width apart and parallel to each other. In Waving Hands Like Clouds, for example, we would start with the body facing straight ahead. The weight shifts to the right foot, the left foot lifts and is replaced as far to the left as possible without moving the body root off the right foot, then the weight shifts to the left foot. The most common error in this step is to lean the upper body to the right as the step goes to the left in order to counter-balance the step. The body should never lean. Another common error is to step sideways by falling from foot to foot, losing the root before the new root is established. The correct way to do this step, as in all stepping, is to sink your weight into your Kua and foot before the step. In that way the body can remain upright and strong. Note: Through the years I have seen some teachers use different widths in side stepping and I like the increase in possibilities that come from this, so the Long Form I teach uses a different width for each of the three repetitions of Clouds Hands – wide (shoulder width), medium( hip width) , and narrow (feet together). In any case, the feet should be parallel and facing straight ahead. This step is used to create some room when opponent is pressuring in. We move backward into a new strategic position. There are several common problems with most beginners retreat step. The first is a narrowing of the stance when putting the foot to the rear. As I said before, most instructors agree that the feet should be shoulder width apart. Many people do not adhere to this principle when stepping backward and this makes them very vulnerable to any sideways pressure as they move the weight onto the rear foot. Another error is the tendency to lean the body forward while stepping back to counter-balance. We are then vulnerable to a quick forward pull from opponent. When stepping back, from Fist Under Elbow into Repulse Monkey for example, it is important to sink the weight into the rear ( right) Kua and foot, place the forward foot (left) to the rear as far as you can without moving your body at all, then shift the weight to the rear foot (left). If you are like most Yang Style practitioners, the stepping back foot is placed at a 45 degree angle to the forward direction and at the end of the movement, the forward foot is pivoted inward on the heel to end up facing straight ahead ( the direction of the opponent). This pivot in of the forward foot is necessary to prevent damage to the forward knee if a sudden straight ahead pull comes from the opponent. Remember, the knee faces the toe and the toe faces where we want the energy to go. Step Back is the opposite of Step Up. It is different from Retreat Step because the forward foot does not change position. Raise Hands and Play the Fiddle are examples. The weight sinks into the forward foot, the rear foot lifts and is set back down slightly further to the rear, and then the weight shifts onto the rear foot. Step Back is used to get quickly back and trap the opponent’s attack. It has a hopping back quality without actually hopping. Note: Step Up and Step Back may be used quite interchangeably. In my form, I do one Raise Hands and one Play the Fiddle using Step Up, and the repeats I do using Step Back. The most common kicks in Yang Style are the Toe , Heel, and Side (Horizontal). Most kicks are directed at the lower body to make defence against them difficult. In the form practice, perform the kicks at the same slow and steady speed as all the other movements. The arms open (neutralize or block) just prior to the kick. Withdraw the kicking leg immediately after kicking so it will be less vulnerable to counter-attacks. In Yang Style, the upper body is erect without leaning during all kicking phases. The body usually faces the opponent in Toe kick, and most often faces sideways in Heel kick. Toe kicks are quick and directed toward the shin, knee, or groin. It is a difficult kick to defend against since it is aimed toward the lower body. It is generally used to keep opponent on guard and at a distance. It is also often used to set up an upper body attack, since most people bend forward to try and block or capture kicks, leaving the upper body open. Toe kicks actually are not done with the toe, as the toes are easily damaged. When kicking the shin, or knee we actually pull the toes back and use the ball of the foot. When kicking the groin, we generally use the top of the foot with the toes tucked under or straight. Yang style toe kicks are performed in one of two ways. The most common is to place all the weight on one foot, lift the other knee until the upper leg is parallel to the ground, then kick by bringing the lower leg upward until the leg is straight. This is called a snap kick. The second method is to keep the leg straight and kick upward by raising the entire leg from the hip. This doesn’t have the same snapping quality but is good when opponent is close and pressuring in. The main error involves leaning back to counter-balance the kick. When kicking, we actually need to send energy down into the standing foot to firm up our base of support and allow most of the energy to go into the kicking foot. The hands will provide all the balance needed to maintain a good stance. In the form as I learned it, the sole kick was the most frequently used kick. This kick is generally directed forward to the opponent’s center, or downward to the knee. Sometimes it is seen going upward to the chin, but only in Kung Fu movies, Wushu tournaments and demos. This kick is more difficult to master.The weight shifts to one foot, the other leg lifts until the upper leg is close to the body, then the lower leg presses outward, with the focus on the sole or heel of the foot. This kick is much more powerful then the snap kick and usually involves a hop forward to gain more energy to release. The most common error for the Sole Kick is not having the hip, knee, and foot all lined up in a straight line when doing the kick. The tendency is to allow the knee to collapse inward which causes the force to be taken in the knee and not the hip and center where the power lies. An interesting difference between the two kicks is that the Toe kick is done mostly with the Quadriceps on the front of the leg while the Sole kick is done mostly with the Hamstrings on the back of the leg. This kick is so named because the foot and leg move in a horizontal plane. The leg is brought up in front of the body and straightened, then swung outward to the side. The force is released from the side of the foot. This is a strong kick directed to the knee, ribs, kidneys, or even the head (very risky but looks good in demos). It is most often used following a spin around to gain momentum (Turn Around and Kick Horizontally). I personally like to see this kick performed at the same slow speed as other movements, but, because of the difficulty of balance and lack of strength in the rotators of the hip, the tendency is do do this kick quite fast. This is actually the most useful of all kicking techniques, given the fact that Tai Chi is predominantly a grappling art. Stomping involves kicking the opponent on the top of his foot, ankle, or even shin in a quick downward fashion using the heel. This stomp is easy to use and extremely difficult to defend against. It is used when the opponent is in front, to the side, or even behind our body. In the form it is seen as Empty Stance on Heel, or any time the foot lifts and the heel is placed down. Raise Hands and Fist Under Elbow are good examples. Tai Chi is a martial art that requires the practitioner to be close enough to the opponent to be able to touch him at all times. Since kicks are most effective at long range, and tend to keep the opponent at a distance, Tai Chi players use knees more then feet. At close range the knee is very powerful. It is directed at the groin, abdomen, hip, and even face (the arms pull the opponent’s head down first). Every time we raise our foot to step, we could be using the knee for a technique. We use the knee when moving forward or backward. The most obvious use of knee in the form is Golden Pheasant Stands On One Leg, (the first movement being a knee strike when moving forward from Snake Creeps Down, the second knee strike when we step back), but it really is everywhere when we look closely. The knee and upper leg are also frequently used to block incoming kicks. In the transition from Repulse Monkey to Slanting Flying , the right knee can be used to block as the body turns to the right. Yang, Jwing -ming uses the Repulse Monkey posture to bring the knee up and block a kick to the mid section. On my first repetition of Stork Spreads It’s Wings, I end the movement with a possible knee kick to opponent’s abdomen as I lift my left foot and set it down into Ding Bow Stance on Toe (Empty Stance on Toe). Another frequent use of the knee is in Bumps. Since we are close to the opponent, the knee is in position to bump the opponent’s knee and cause disruption to his balance and body connection. Bumps are mostly used in combination with pushes, and throws. A Bump is executed by placing the leg next to the opponent’s knee and then moving the weight on to that leg, like moving from Sit Stance onto Bow Stance. It is generally used in a quick bumping fashion, but when used more slowly can take the opponent to the ground by a constant pressure on the outside of his knee in an inward direction. Sweeps are useful to break the opponent’s root on his forward or rear foot – anytime there is weight on a leg. Any step can mean a sweep is possible, especially the Unweighted Forward Step and Replace Step. For a sweep to be effective,we have to either stabilize the opponent’s upper body while we sweep, or move the upper body in one direction while we sweep the leg in the other. This stabilization keeps the opponent from being able to take the weight off the foot that is being swept. Brush Knee and Parting the Horse’s Mane are good examples. Trapping is the art of putting one’s foot and leg in a place that will make the opponent’s next move difficult, or our execution of a technique more effective. This generally means behind or to the side of our opponent’s foot, so when he tries to escape, he finds his leg is trapped by our leg. It is our intention in Tai Chi to always have the opponent off balance, while we at the same time are always in balance. By placing our leg behind the opponent and then applying Push or Press, we gain greater results. Trapping techniques are quite subtly illustrated in the Yang Solo Form, and much more obvious in the Two Person Applications Form. Our Tai Chi practice must be alive so that it does not become stale. We must allow ourselves to change the form as our understanding of what we are doing and what we want to accomplish deepens. As the saying goes, “you can never step into the stream in the same place twice”. Life moves, things change. If they don’t change, they stagnate and die. Our Tai Chi forms must remain alive, and it is our Intention that brings life to the form. If we blindly follow the teacher after we have mastered what we were taught, the form may lose interest for us, and become stiff and tired. It is my hope that this discussion will aid in the understanding of how our form was developed, why the movements are the way they are, and inspire us to liven up the form. It is important to take the time to go through each and every movement and make sure that the feet and legs are under conscious control at all times. This examination will increase our Intention thereby increasing our ability to lead chi and accomplish the ultimate goal of reaching Self Realization, and we’ll have more fun in the process.